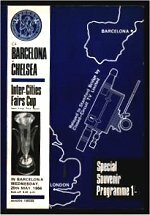 Chelsea qualified for the Fairs Cup by League position, finishing third in the First Division in 1964/65. After finishing the two legs all-square at 3-3 Chelsea lost the toss of a coin to decide the venue for the play-off. The decider in Milan also ended all-square and this time Chelsea captain Ron Harris made the right choice with a toss of the coin deciding that Chelsea would progress. It proved to be another tie that needed a third match to decide. Chelsea again lost the toss of the coin to decide venue with Barcelona then making home advantage pay to the full.